When you own a pool, one of the most important things to think about would be pool safety. When we talk about pool safety, this does not mean security wherein you need to install a pool alarm and a pool fence to keep away trespassers. It means the balance of the pool chemicals or pool cleaners in your pool. 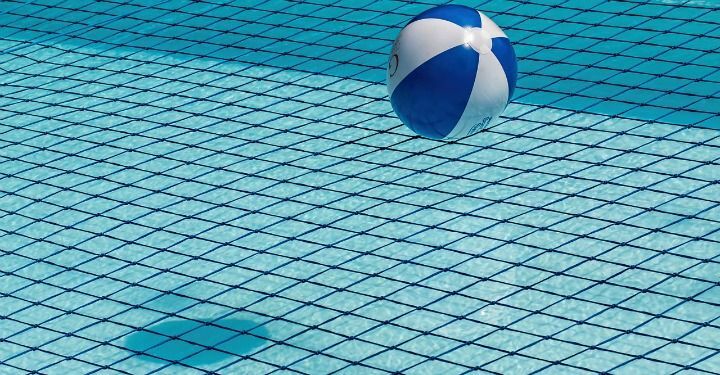 If the chemicals in your pool are not properly balanced, then you and other people who take a dip into the water may suffer from certain conditions such as skin allergies. This is why it is extremely important to ensure that your pool always has a good balance of chemicals. It should be enough to clean the water and kill bacteria but not too strong to harm your skin. The best way to ensure the balance of chemicals and other substances in the pool is through testing. 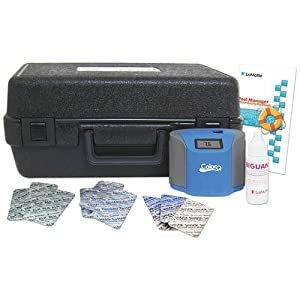 The only way to readily do that anytime you want is to purchase the best pool test kit that you can find on the market. That way, you’ll know how much cleaning agents you should put in your regular or above ground pool. Chlorine: This would either be TriChlor or DiChlor. Both are used for chlorinating pools with TriChlor usually needing to be added to an installed chlorinator and the DiChlor being able to chlorinate pools quickly. Bromine: Bromine is used for making the pH level of water more stable so that it won’t become too acidic. Cyanuric Acid: This is a chlorine stabilizer that can also serve as a chlorine protection from UV rays. These are usually added to dichlor and trichlor. Calcium Hypochlorite: This chemical is used for sanitizing the pool and killing the algae. It is also known to boost up the chlorine level in the pool. Calcium Hardener: This is used for increasing the hardness of the calcium in the pool. Alkalinity Increaser: The alkalinity increaser is a sodium bicarbonate which raises the total alkalinity level. pH Increaser: As the name implies, this is a chemical made of granular soda ash that can increase the pH level. pH Decreaser: This chemical is a granular sodium bisulfate and is used for reducing the pH level of the pool. In a standard pool water test kit, you’ll have your casing which will be used to hold all your materials. Inside the case, there would be color scales made out of UV protected color chips. This is where you will mix your pool water with the solutions to check chemical levels. You’ll also have pool test strips that can be used for holding the chemicals and checking the results. Lastly, you have the solutions that will be used for checking the pool filter chemicals and cleaners. Essentially, there are four portions to test. These are the pH levels of the pool, the calcium hardness, the total alkalinity of the water, and the level of cyanuric acid. In order to do this, you dip the plastic pool strips into the pool first to get a sample of the pool water. Now, with each section of tests, there is a vial where you are supposed to put a few drops of solution and some sample pool water. The ideal pool chemical levels are chlorine amount at 1.0 to 2.0 ppm, pH level at 7.2 to 7.8, total alkalinity level at 80 to 120 ppm, cyanuric acid level at 20 to 50 ppm, and calcium hardness at 200 to 400 ppm. Also, the total dissolved solids should be below 5,000 ppm. It’s best to test your pool every day to know if your pool is chemically balanced or not. However, if you do not have the time, then you just need to test your pool once or twice a week. If you swim every day, then it is highly recommended to test your pool every day. It keeps your pool clean from dirty substances such as dirt, bacteria, and algae. It ensures that the chemicals used for cleaning the pool aren’t too strong on the body. It helps protect the water from the breakdown effect of sunlight. It enables you to check the amount of total dissolved solids so that you’ll know when you must refill the water. 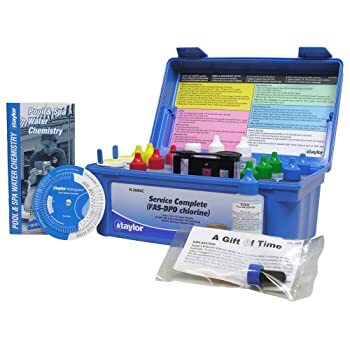 The Poolmaster’s 5-way test kit measures 5 chemical components of a swimming pool with very easy to read indicators to test the chemical levels of your pool water. It is also very affordable for those who are on a tight budget. It can test for 5 aspects, namely chlorine level, bromine level, pH level, total alkalinity, and acid demand. It is good in maintaining overall water chemistry. It has colored chips for determining the chemistry. It includes solutions used for testing chemistry. It comes with a polyethylene casing. The chlorine testing needs to be done carefully for an accurate result. The complete Taylor service pool water testing kit is good not only for home pools but for commercial pools too. It has 2-ounce solutions with titrants that can increase the accuracy rate of the results. It is the fastest in producing good and accurate results. It includes 2-ounce bottles for drop water testing. It provides quick and accurate results. It can test for chlorine levels, bromine levels, pH level, calcium hardness, acid demand, base demand, alkalinity, and stability for all levels. It is one of the more expensive brands of pool testers. Looking for a complete pool water test kit that delivers digital result and is priced reasonably? 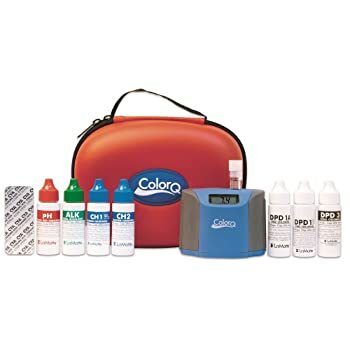 This Pro 7 Digital Pool Water Test kit by ColorQ is a great choice. 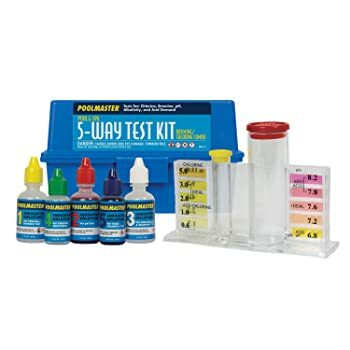 This test kit allows you to do 7 types of pool water test to ensure that the chemicals present in the water are well-balanced. Users of this pool water test kit vouch for the products convenience, as well as its accuracy. You can test your pool water’s pH level, alkalinity, calcium hardness, bromine, cyanuric acid, free chlorine level, and total chlorine. This includes a carrying case that is water-resistant and durable. There is also one photometer, which helps you test the intensity of light when doing water tests. Using the kit is simple. It’s a straightforward process, which many users appreciate. Gives accurate results; hence, many are confident using this kit. You can find much cheaper alternatives, but ColorQ pool water test kit’s performance and accuracy are unmatched. The chemicals come in small bottles, which means that the kit only lasts for a few uses. This 6 in 1 electronic pool water tester acts as a digital pool tester and a pool thermometer at the same time. This is the ideal tester to use if you don’t want to use drop testing or strips. All you need to do is get a water sample and dip the digital meter to test the water components. It has easy to use buttons. Aside from the 4 standard aspects that it tests, it can also determine salt content and even the temperature. It has large LED readouts for easier reading. It can save your last reading until the new one is taken. It runs on 2 AAA batteries, which may run out faster than expected. Lamotte ColorQ Pro Water Testing Kit is another digital pool water tester that measures the light intensity in order to get a good result. It can measure chlorine, bromine, total alkalinity, pH, calcium hardness, cyanuric acid, copper level, iron level, biguanide, and biguanide shocks. You also don’t need to worry about color matching as it can give instant results. It is an easy to use digital photometer pool tester. It can test for 11 aspects of the pool. It has a very high accuracy level. It is able to produce results very fast. When you want to select the best brand for your pool tester, it’s best to have many choices so that you can compare and contrast its pros and cons. That’s why you should read a lot of pool test kit reviews beforehand so that you can have a better idea which is the best pool test kit for you. 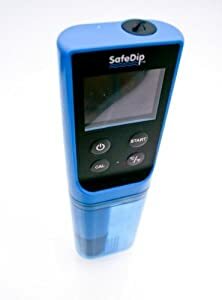 Out of the 5 pool testers that were mentioned, my personal preference would be the LaMotte ColorQ Pro 11 TesTabs Digital Pool Water Testing Kit. Yes, it is the most expensive one out of the five; however, it can give you a complete measure as to the chemistry of your pool since it handles 11 different chemicals tests. It is also very easy to use as you don’t need any color matching and such. The digital tester can do it all for you.